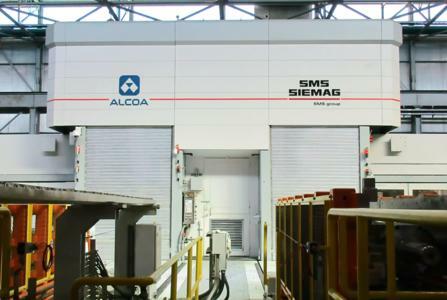 As key supplier, SMS group delivered and commissioned an ultra-modern twin-stand aluminum tandem cold mill newly installed at ALCOA Inc. near Knoxville, Tennessee, U.S.A. The new cold rolling mill is part of Alcoa’s automotive growth project. In September 2015, Alcoa announced that the mill was complete and shipping to customers. The expansion focuses on the production of wide and durable aluminum sheets for lightweight car body construction. The twin-stand rolling mill was supplied, installed and commissioned by SMS group. The new equipment and automation systems were thoroughly tested, validating their reliable compliance with the stringent quality demands. The automotive expansion at Tennessee will continue its ramp-up throughout 2016. The SMS group is, under the roof of SMS Holding GmbH, a group of companies internationally active in plant construction and mechanical engineering for the steel and nonferrous metals industry. Its 14,000 employees generate sales of over EUR 3,4 bn.